PORTLAND, Ore. — The BYU men’s basketball team earned a 72-60 win over Portland in its final road game of the regular season on Thursday night in the Chiles Center. Yoeli Childs and Elijah Bryant scored 15 points apiece in the win. With his 14th double-double, Childs also totaled 13 rebounds, three assists, one block and one steal. Bryant added six rebounds and two assists. Dalton Nixon contributed 14 points, two rebounds and two assists. TJ Haws scored 10 points while adding four assists and two rebounds. The Cougars (22-8, 11-6 WCC) opened up the game with three consecutive 3-pointers by Bryant, Childs and Haws to take an early 9-5 lead. Six straight points by the Pilots (10-20, 4-13 WCC) evened the game at 11-all with 14:22 remaining on the clock in the first half. Childs ended Portland’s run, scoring on one end of the court and grabbing a steal on the other end, as BYU fought to stay on top. The Cougars went on an 8-0 run to take a 19-11 advantage with 10 minutes to go before halftime. Bryant converted on a 3-point play to give BYU a double-digit lead, 24-13, respectively. Back-to-back treys by the Pilots brought them within five but was answered by Nixon’s own bucket from beyond the arc. Another 3-pointer by Nixon gave BYU a 12-point lead, 32-20 with 6:18 on the clock. Through the remaining minutes in the first half, the Cougars consistently kept the double-digit lead and ended with back-to-back buckets by Bryant and Zac Seljaas, extending BYU’s lead to 42-28, the largest of the half. In the first half, the Cougars shot 50.0 percent from the field and 31.3 percent from the 3-point line. Defensively, BYU held Portland to 34.5 percent from the field and 27.3 percent from beyond the arc. Nixon continued to find the hoop as he opened up the second half, scoring six of the Cougars’ first eight points for a 50-32 lead. The Pilots went on a 9-0 run to cut the deficit to nine points, 50-41, with 12:07 left in the game. Luke Worthington’s first bucket of the night slowed down the Portland offense before layups by Bryant and Haws put BYU back on top 58-45 with nine minutes to go. With just over five minutes left in the game, the Pilots hit a 3-pointer to cut the Cougar lead to nine points, 63-54. BYU concluded the night with points by Jahshire Hardnett and Seljaas to secure its 72-60 win over Portland. On the night, the Cougars shot 46.0 percent from the field, 29.2 percent from three and 77.8 from the charity stripe compared to the Pilots 40.7 percent shooting, 28.6 from beyond the arc and 83.3 percent from the free-throw line. BYU closes out the regular season on Saturday, Feb. 24, as the Cougars host No. 6 Gonzaga at 6 p.m. MST in the Marriott Center. The game will be televised on ESPN2. Audio broadcasts will be available on BYU Radio (Sirius XM 143), BYU Sports Network and Easy 101.5 in St. George. 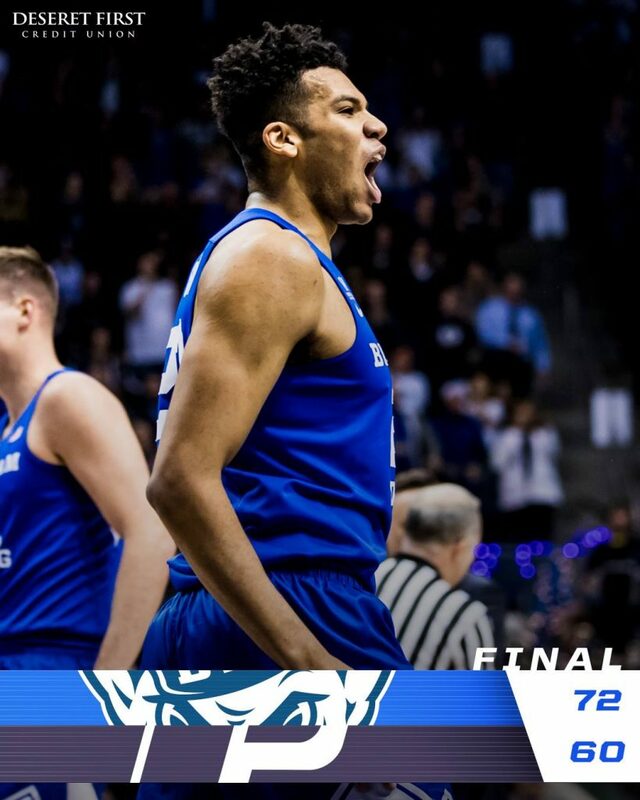 Yoeli Childs finished with 15 points, 13 rebounds, three assists, one block and one steal. It was his 28th game this season scoring in double figures and his 14th double-double of the season, 19th of his career. Elijah Bryant finished with 15 points, six rebounds, two assists, one block and one steal and hit two 3-pointers. It was his 25th game scoring in double figures and 22nd with multiple 3-pointers. Dalton Nixon scored 14 points, his third game this season scoring in double figures. He also hit a career-best two 3-pointers. TJ Haws scored 10 points, his 20th game in double figures. He also hit two 3-pointers, his 13th game with multiple 3-pointers. BYU hit 50.0 percent (18 of 36) from the field in the first half, its 12th first half shooting 50.0 percent or better this season.